This time it’s a welcome return to Live and Loud! for The Human League. There aren't many live recordings of the first incarnation of the band and I’ve been trying to track down this particular recording for some considerable time. And then within a month, I had 3 copies! Unfortunately all 3 are quite flawed 1 way or another. Despite this being such a short recording (originally from Dutch radio), this may well have taken me the longest time to repair and restore! However, I think its been well worth it. 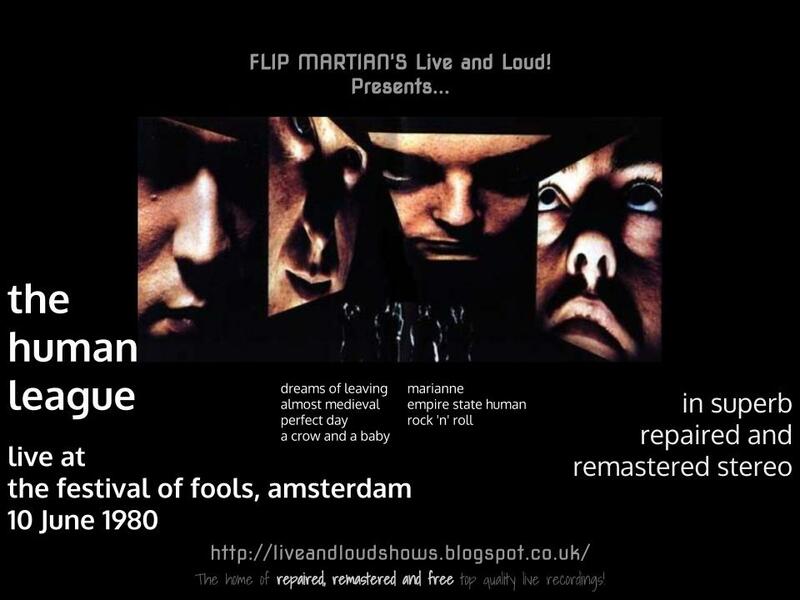 It is, quite simply, now clearer and better than any other live bootleg of The Human League I've come across to date. This performance, at a mixed arts festival in Amsterdam, was (I think!) the last to feature the original lineup. On that basis alone it needed a decent copy of it preserving; I hope this is it. Thanks for taking the time to do this. I love this Human League period and it's so thrilling to hear how they were live during this time. Thanks for taking the time to respond. The good news is that I have since been sent another, complete set from an earlier gig by the Mk 1 lineup. An audience recording but a fairly clear one (certainly better than the other Human League audience recording I have on here). So that will be coming up early next year sometime, once its been worked on and improved. Hi Flip, you're doing great work here. Too bad that there are only so few recordings from the original line-up era. As usual it's wonderful to hear what you manage to achieve with the source material. Keep up the good work! Thanks for the feedback! Check back soon - should be another HL Mk1 early next year (see comment above). Cheers! It's great to hear Phil get the lyrics wrong so often ! Contact Martyn Ware on facebook with a link, I'm sure he'd appreciate it! Yeah I like the mistakes too - 1 reason I love bootlegs. Cheers! Thanks, glad you enjoyed it. Cheers! Don't take too long with the next post.....looking forward to it. A massive thanks from Sydney, Australia. Keep the great work up!!!!! !